Welcome to Shoal Bay. No, it's not the one that everyone knows, the one with body surfers, snorkelers, beach tanners, kids building sand castles, the one lined with beach bars and restaurants. This 'Shoal Bay' is located on the western tip of the island and has a much calmer feel. Anguilla has two Shoal Bays -- and both have "shoals" or reefs-- Shoal Bay East gets all the publicity, but Shoal Bay West is a perfect, crescent shaped beach at the West End of the island. 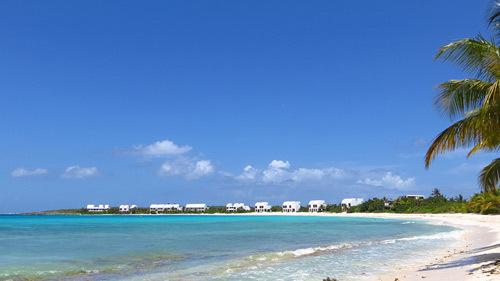 It is quiet, with a beautiful view of St. Martin, and a long arch of Anguilla sand. On it you will find of CoveCastles Resort, one private home, Trattoria Tramonto (a Northern Italian restaurant), Altamer Resort and Restaurant, and Blue Waters, a small beachfront apartment resort. 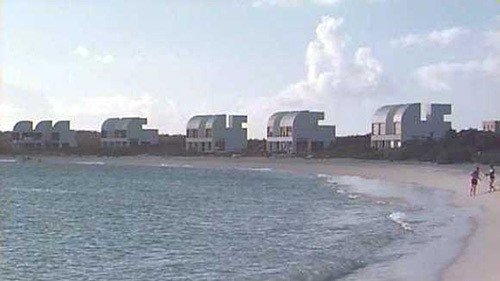 If you prefer long quiet walks on an almost empty beach while cherishing stunning views of St.Martin and the sounds of the calm blue ocean surf at your toes, then Shoal Bay West is the beach for you. Directions: You reach Shoal Bay West by taking the main road to the West End and turn left at the end of the pavement on a gravel road around the pond. Park between the restaurant and Blue Waters.